“I come from a simple family,” Mark says. “Anything I needed – clothes, food on the table – I had. And it was appreciated, believe me.” Mark was also baptised, and he and his siblings attended church regularly. But when Mark was 16, his little sister was killed in a car accident. Her death devastated his close-knit family and he chose to go his own way, earning a living as a painter and warehouse worker. He had experimented with alcohol for several years. But his destructive habit remained in check when he lived at home. Now, with no fear of reprisal, his drinking escalated to an addiction that, over the years, impacted every area of his life. Finally, in what he now calls “a blessing in disguise,” he was nearly paralyzed in a fall from a ladder. “I spent three days in the hospital and that’s when I knew I had to make a decision about what to do with my life.” After he was released, he came to our Men’s Emergency Shelter, where he was encouraged to join our Christian Life Program. He is embracing the spiritual guidance from our Christian counselors and case managers who are helping him strengthen his relationship with the Lord. “I’m closer to God than I’ve ever been,” he says. 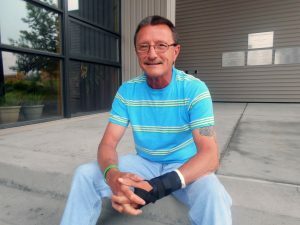 “I talk with Him on a daily basis – I pray several times a day.” He is also replacing his destructive behaviors with activities that bring meaning to his life, taking life-skills classes or eagerly helping with chores around the facility. “I’m busy all the time… I’m content,” he shares. Today, vowing to live for the Lord, he is relying on God to direct his future.